Pumpkin pie is pretty much a standard dessert at Thanksgiving. I’m sure there are plenty of people who opt for something else but at our house there would be a revolt if there weren’t any pumpkin pie. 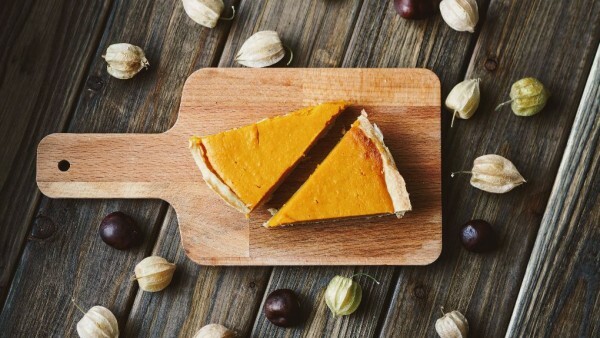 When I was growing up pumpkin pie was always part of the Thanksgiving menu, but my mom wasn’t much of a baker, so the pie was always purchased at a local deli. I always enjoyed it and thinking back I realize that my mom was smart not to stress herself out over dessert every year. But then there was the first year we had Thanksgiving with my husband’s sister, Peggy, and her family. She not only made homemade pumpkin pie, she made it with real pumpkin! Not that the stuff you buy in cans isn’t real but Peggy’s pumpkin was of the straight from the garden variety. Seriously! I thought I’d died and gone straight to pumpkin pie heaven. We spent many Thanksgiving holidays with Peggy’s family and she always made the pies-no matter which of us hosted. But as our kids got older and started getting married it became harder to get together which meant, I had to figure out how to make-or buy-my own pies. Of course, I had the option to follow in my mother’s footsteps and order the pies at the local bakery, but to be honest; I was spoiled at this point so I called Peggy for her recipe, which she graciously shared. Admittedly, I sometimes use Festal or Organic canned pumpkin instead of cooking my own. And, it’s good, but if I have the energy I start with a little sugar pie pumpkin. The good thing is you can do this weeks in advance and freeze it so it’s not so stressful when it comes time to make the pie. After a bit of trial and error I found the easiest way to cook the pumpkin is to put it in a casserole dish whole (maybe with a titch of water in the casserole). Bake it for 2 hours at 375°. Cut it in half, scoop out the seeds and discard, scoop out the flesh and stick it in baggies for freezing (let it cool first). It’s easy peasy if you use this method. If you cut it up first you risk slicing your thumb open and yes, I know this from experience. Peggy’s crust is to-die-for also but admittedly, sometimes I cheat and buy the pre-made Pillsbury crusts to save time. They aren’t as good but they’ll do in a pinch. One year my son and I worked on the pies together. We made the crust, and because I have a love for uncooked crust, I tried a small bite of the dough before we added the pie filling. It was horrible! As it turns out, we’d forgotten the salt. (Don’t do that!) We had to throw that batch out and start again. Imagine how frustrated we were when we realized we’d forgotten the salt a second time! We hadn’t rolled it out yet though so we tried adding it at that point, but with no success. As they say, the third time’s a charm and though we weren’t laughing much then, it’s funny in our memories! With permission from Peggy, I am happy to share this amazing pie recipe with you along with a confession. This recipe makes two pies and one year our mouths were watering on Wednesday night when we pulled them out of the oven. We were all struggling with the wait for Thanksgiving day when I said, “You know, we only need one pie for tomorrow. There’s really nothing stopping us from having a piece tonight.” And we did! Blend above to pea size pieces – Add 1/3 C. COLD water. Roll out of floured pastry sheet until it’s just big enough to cover your pie pan. “Flute” the edges as best you can but unless you’re entering it in the fair, no one’s going to judge your lack of perfection. Here’s to some pre-Thanksgiving pie, whether you buy it at the bakery or make your own! When you look back after its baked and you seeing the beautiful pie, makes ya’ kinda proud, huh? I understand making the pie crust part. You have to stay in practice with making a flakey pie crust or biscuits. To me, the crust makes the pie. Since we have sweet potatoes, we have sweet potatoe pie instead of pumpkin. It’s not that I don’t like pumpkin, this area where we live grows lots of sweet potatoes. I know your Thanksgiving dinner will be wonderful, full stomachs, lots of love and so thankful for many blessings. Thank you for sharing the recipe. 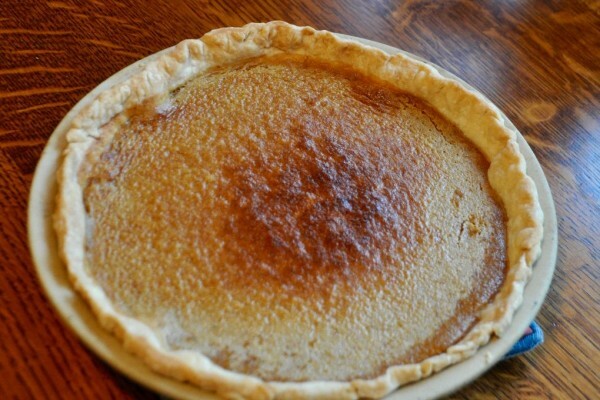 I’m looking at a little pie pumpkin I have on my porch and may just give this a try.